Rolando Herrera runs Mi Sueño Winery in Napa Valley, which annually produces about 8,000 to 10,000 cases of premium estate Chardonnay, Pinot Noir, Syrah, Cabernet Sauvignon, Malbec, Petit Verdot and a specialty blend. The family-run operation, Spanish for “My Dream,” has 16 full-time employees and 40 acres of vineyards — with another 23 planned. Herrera was a high school senior on a summer construction job — making big rocks into small ones for some guy renovating a house overlooking vineyards. He knew nothing about the homeowner, Warren Winiarski, and had no idea what those grapes meant. The founder of Stag’s Leap Wine Cellars, Winiarski had upended the viticultural world when the Cabernet Sauvignon he crafted from his 1973 grapes bested the French Bourdeauxs in the now famous 1976 Judgment of Paris blind tasting. Napa would never be the same. Taken by Herrera’s work ethic, Winiarski offered him a job during the upcoming harvest. Herrera’s father had brought the family to Napa in 1975, when Herrera was 8. But he moved the family back to Michoacan just five years later. Herrera was determined to come back. When he turned 15, he announced that he was leaving for Napa to get his high school degree. After his first harvest at Stag’s Leap, Herrera was hooked. He worked his way through Napa Valley College, then took every crash course in viticulture offered by UC Davis. After three years, Winiarski promoted him to cellar master, executing the orders of the iconoclastic and detail-obsessed winemaker. By 1995, Herrera was dreaming bigger. Casting around for a winery that would let him do a bit of everything, Herrera found Chateau Potelle, an old-school European winery run by Marketta and Jean-Noel Fourmeaux. For French winemakers, it’s all about terroir, the characteristics of soil, water and sun that give grapes a unique signature. That concept sounded familiar to Herrera. Back home in El Llano, Michoacan, Herrera’s grandparents would take him to their mountain property on weekends so that he could pull weeds and move rocks on a small plot where they grew food for the family. Why can’t we just eat what we grow down on the farm, he recalled asking. 1997 proved to be a great vintage for Herrera, personally and professionally. He married his longtime sweetheart, bought his first grapes and became a winemaker. In the beginning, Mi Sueño teetered on nightmare. Herrera took a job as winemaker with Vine Cliff Winery, which let him work on his own wine on the side. But when he moved on to work for Paul Hobbs, he was back to begging. He rented a 4,000-square-foot warehouse even though Mi Sueño was a 50-barrel dream that wasn’t likely to make the rent. 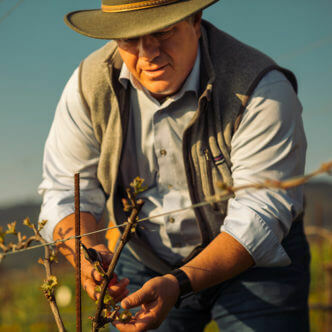 Herrera slowly branched into consulting, picking up new clients and some vineyard acreage even as he improvised and held together his own operation. In 2006, Herrera bought his own warehouse, now his company’s headquarters. He has six children of his own — “five princesses and one champ,” he said. All have worked in the winery and vineyards, the littlest mostly just watching what “papa” does, and slapping stickers on cases. The rest of Herrera’s family eventually came back to Napa from Mexico, and Herrera helped several of his siblings get through high school without having to work. Two brothers are now in the wine business as well. Herrera looks back at his reluctant move from Napa to Mexico as a hard but important lesson in life and winemaking. Uprooting vines and replanting is part of the cycle of the vineyard. Knowing when to uproot for something new was crucial to making an idle dream into Mi Sueño.